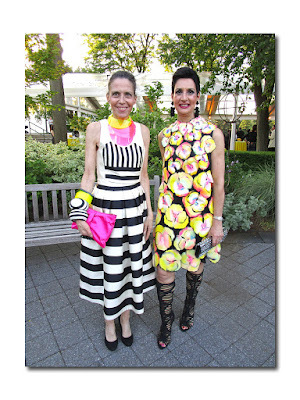 Last evening, the New York Botanical Garden held its most important fundraiser, The Conservatory Ball. The setting: its lush 250 acres of dazzling landscape in the Bronx. Admittedly, this is not the most conveniently located venue but once there, it is so worth it as you are instantly transported out of the bustling metropolis to a place of great natural beauty. 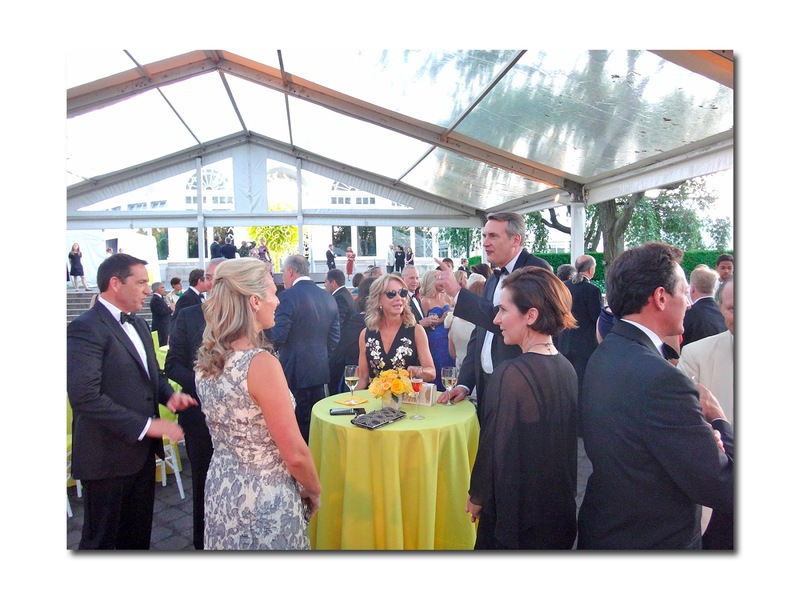 It is not only a major fundraiser (over 1.7 million was raised, which will benefit NYBG’s plant research, conservation, and children’s education initiatives serving more than 325,000 children and families in the tristate area), it marks the end of the spring benefit season in New York and unofficially heralds the beginning of summer as the philanthropy and social set head off to the Hamptons. Gala Chairmen were Alexandra Lebenthal, Gillian Miniter, Deborah Royce, and Catherine Marlette Waddell (they stood on the receiving line with Gregory Long, President and Chief Executive Officer of The New York Botanical Garden). The black tie gala was attended by an eclectic group that included Domenico de Sole, Jean Shafiroff, Victor de Souza, Michael Gross, Fe Fendi, Linda Fargo, Cameron Silver, Michelle Smith, Barbara Cirkva and John Schumacher, Dr. Sherrell Aston and Muffie Potter Aston, Becca Cason Thrash, Eric Javits and Di Mondo, in a flower strewn white dinner jacket. What else is new? lol. 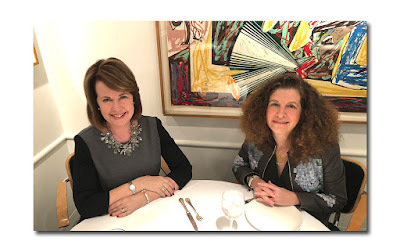 The event was held in partnership with Northern Trust and additional support was provided by Naeem Khan (who was there) and fine jewelers Verdura/ Belperron. Duke Fulco di Verdura and Suzanne Belperron revolutionized jewelry in the 20th century and were favored by prominent style setters as the Duchess of Windsor, Coco Chanel, and Diana Vreeland. Both storied companies are now under the tutelage of Ward Landrigan, owner and chief executive officer, and his son Nico, president. They were there last night along with James F. Haag, Jr., Vice President, Managing Director and several executives. To make things interesting, some of their dazzling jewels were on display (Verdura’s signature Maltese cross cuffs just happen to be on my personal bucket list and I had a chance to try them on). 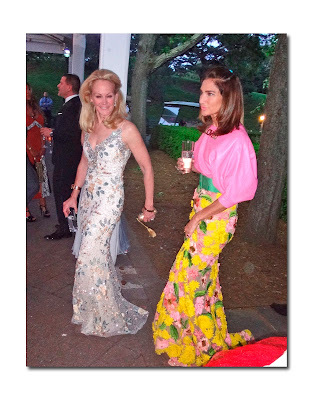 A lucky few, including Kim Landrigan and Caroline Willimanson were decked out in Verdura. 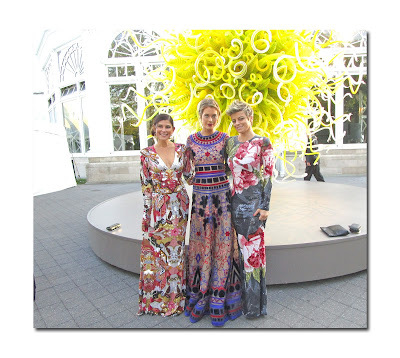 It was hardly surprising that quite a few of the approximately 500 guests were wearing one of Naeem Khan’s ornate, intricately detailed dresses. Among them: Alexandra Lebenthal, Deborah Royce, Gillian Miniter, Genevieve Barker, and Lisa Harbert. 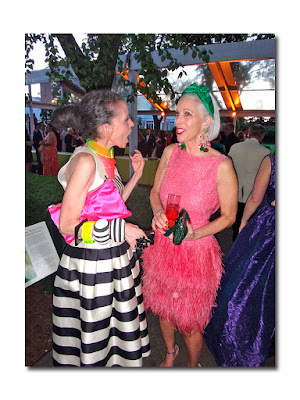 Linda Fargo, looking like a beautiful flower in his short pink feather trimmed dress, took it a step further and accessorized with a green headband and a pair of shoulder dusting colorful “Garden Party” earrings by the designer’s talented wife, Ranjana Khan. FYI, while Linda, who is a good friend of the Khans, has attended the NYBG’s Winter Wonderland in the past, this is the first time she has gone to the Conservatory Ball. Upholding my conviction that you can’t beat red for impact, Jean Shafiroff made quite an entrance and really stood out in Victor de Souza’s fire engine red Unicorn dress with full tulle skirt (she arrived with the designer). As soon as I saw her, I was reminded of Spanish designer Sybilla’s quote: “When you’re wearing red, you feel like you can eat the world!” Indeed. But while the glamorously decked out guests and the NYBG’s glorious gardens are always a feast for the eyes, this year they had serious competition from Dale Chihuly’s breathtaking, translucent and transparent neon glass sculptures, which comprise CHIHULY, this year’s featured exhibition. The acclaimed Washington born American artist has spearheaded the development of glass as a fine art and his works, a marvelous convergence of glass, color, and light, are considered to be unique in the field of blown glass. 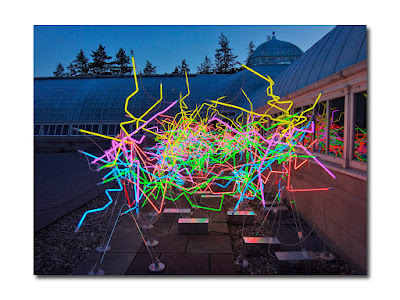 While he has had ambitious installations in public spaces as well as exhibitions in museums and gardens around the world, this is his 1st major garden exhibition in New York in over 10 years. Unfortunately, he was not present last evening (at the age of 75 he doesn’t travel that often), but he did attend the opening back in April. Arranged in 20 installations both inside and out, along with sketches of his earlier works, they are on display through October 29 and provide the perfect if not counterintuitive backdrop against the natural beauty of NYBG’s sweeping vistas and magical Conservatory (the natural alongside the artificial/man made). 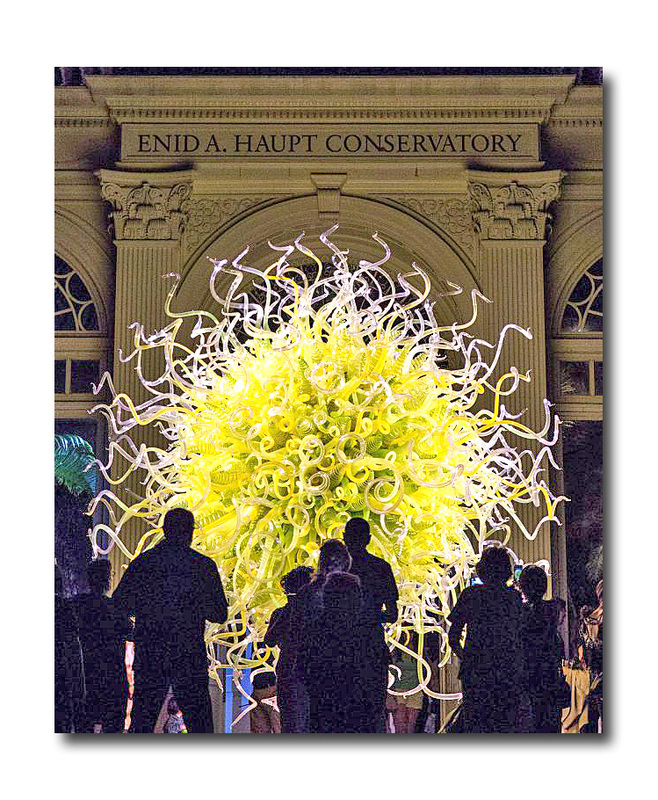 As night began to fall and guests wound their way from the Perennial Garden where they enjoyed cocktails, to the Conservatory Tent for dinner and dancing, they could begin to fully appreciate Dale Chihuly’s colors and forms, which were lit under the evening sky. 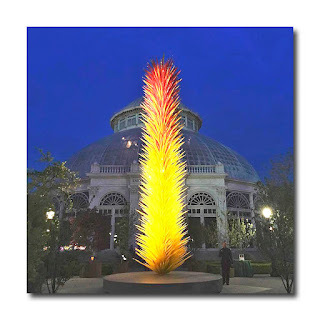 The NYBG has wisely capitalized on the drama of the illuminated exhibition by creating CHIHULY Nights which takes place from 6:30 to 10:30 pm. Since darkness is required in order to fully enjoy this experience, the optimal viewing time obviously varies with the time of the year. Finally, on a personal note. 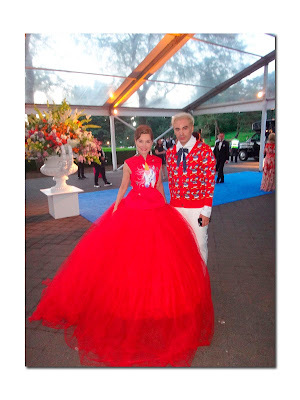 The one year anniversary of Bill Cunningham’s death is June 25th and it’s still impossible not to think of the famed photographer at certain events; the Conservatory Ball is certainly one of them. I saw him there last year, in celebration of their 125th anniversary and he was in fine form and quite in his element, making the most of the glorious natural setting as he snapped away at the beautifully dressed women. He was a man who was truly captivated by nature as much as fashion and the mix always proved to be a heady combination for him. “Force of Nature”, the new exhibition at the Museum at FIT, which opened on Wednesday and was a subject of an article by Laurel Marcus, examines the way nature in all its forms has inspired both art and fashion and touches upon the symbolism of plants and the influence of exotic botanic gardens (included in the exhibit is a feathered hat and cape of his design from the 60’s). 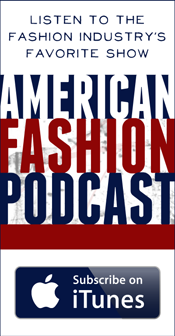 There is nobody who knew how to make the connection between fashion, art and nature come alive quite like Bill. He was indeed a force of nature.